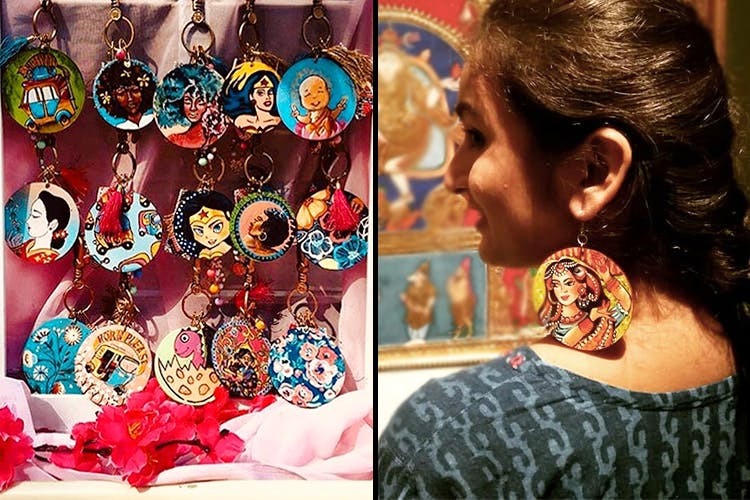 Banithani is doing beautiful, hand-painted earrings and pendants with intricate portraits on them. In addition to doing statement accessories, they're doing stationery too—so, literally two of our favourite things. Colourful notebooks, statement pieces, portraits on jewellery. Basic accessories not your thing? If you're someone who loves bold, statement earrings, these guys should be on your radar. Their colourful, intricate pieces are so different (and kudos to everyone who can pull these off).With miniature portraits hand-painted on wooden bases for pendants and earrings, our personal favourites are their Frida Kahlo and Lana Del Ray earrings. They're also doing charms for your bag (you can use these for your notebooks or phone covers too). Speaking of notebooks, they're doing bright, vibrant ones with hand-painted covers that are just the splash of colour you need. If you have a friend who loves this kind of stuff, it'll be a great birthday. Order them a pair or a charm for their bag, you can check out more of their work on their Instagram.